John Oliver’s Last Week Tonight is more than a parody news show, it’s an arm-chair action center. Through news segments that are not only humorous, but that also offer more in-depth reporting on subjects that are often glossed over or ignored on standard television news programs, John Oliver educates folks. (Yes, I said “reporting). In addition, whether Last Week Tonight tries to brandish momentum on a topic through Twitter (calling out the media restrictive Ecuadorian President Rafael Correa, who, incidentally perpetuated a Twitter war with the comedian in response) or providing a government website on which to check how cozy a relationship your physician has with the pharmaceutical company (a site I had never heard of), Last Week Tonight usually offers an action step on how to poke at the quiet beasts hovering over our lives. Last night’s episode was no different. Although smoking has greatly declined in the United States thanks greatly to legislation on public puffing restrictions and advertising campaign, smoking has increased around the globe while cigarette companies are enjoying record profits. 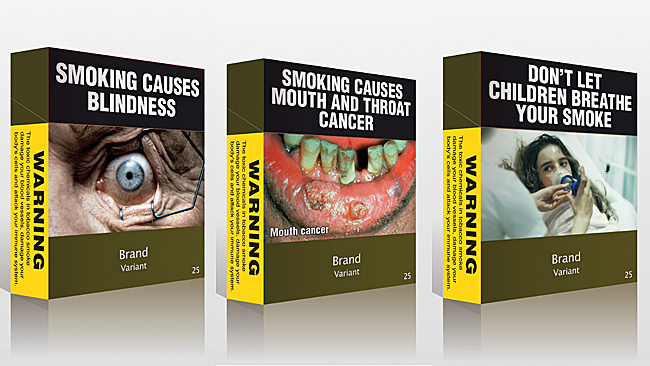 Last Week Tonight’s detailed how tobacco corporations are availing themselves of all avenues to strong-arm countries like Australia into removing explicit warnings from packages and even bullying countries with much smaller economies, such as Togo and Uruguay, into backing down due to legal fees. Not only are these corporate behemoths working against governments, they are also using their massive wallets to fight the tide of public support within the nations. 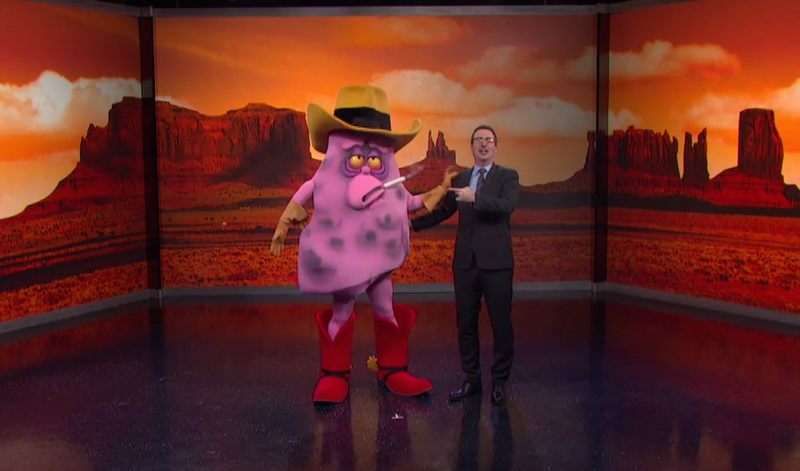 In order to help fight the good fight, Last Week Tonight’s staff, with inspiration from Joe Camel cartoons and Marlboro Man advertisements, created “Jeff,” the personable smoking emphasemic lung man complete with cowboy gear that the HBO show is in fact offering for free to Philip Morris. But, Last Week Tonight didn’t stop there. They installed actual billboards in Uruguay and sent T-shirts to Togo with the diseased -but lovable- smoking character. 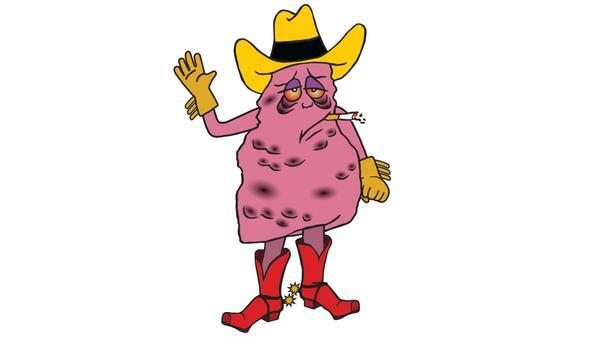 Share #jeffwecan and tune in for the next arm-chair action because unlike smoking, adding Mr. Oliver to your diet is not hazardous to your health (at 30 minutes/week, the payoff of information is worth the sedentary period). Click here for Dr. Nina’s What You Need to Know about the numbers behind smoking (article available Wednesday, 2/18/15) and quitting smoking. Last Week Tonight is ‘not being a maybe’! In all seriousness (ironic for a comedy show), the show is a breath of fresh air (ironic given the tobacco sequence) in that it is so much more daring than the other late-night satire shows. The LWT team are clearly not scared of anybody, and are prepared to go into phenomenal depth researching the rich, the pompous and the over-powered. And the resources the series puts into some of its set-pieces are impressive e.g. 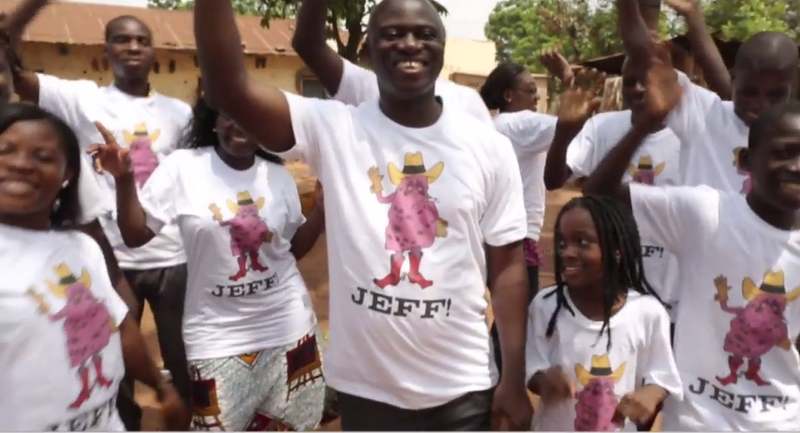 the dogs of the Supreme Court, the T-shirts and posters of Jeff sent around the world with film-crews. John Oliver is such an energetic and likeable host, and every script has clearly been ruthlessly refined and redrafted right up to the final moments before the episodes start recording. You pretty much summed it all up. Good job!! For once maybe an America can come out ahead against a Corporate America that doesn’t give a damn about humans or the earth. Hooray for a step for world health and against corporate American. If we could win just one battle I would see some hope. Yes, it’s good to see someone using a platform like a TV show to create some static about things we do not usually here about …thanks for reading, Sylvia!